Please bring headshot and a one-minute comedic or dramatic monologue. Seeking actors and actresses ages 20-80. Winner of the 2008 Tony Award for Best Revival of a Play, this 1960's French farce features self-styled Parisian lothario Bernard, who has French, German and American fiancées, each a beautiful airline hostess with frequent "layovers." He keeps "one up, one down and one pending" until unexpected schedule changes bring all three to Paris and Bernard's apartment at the same time! 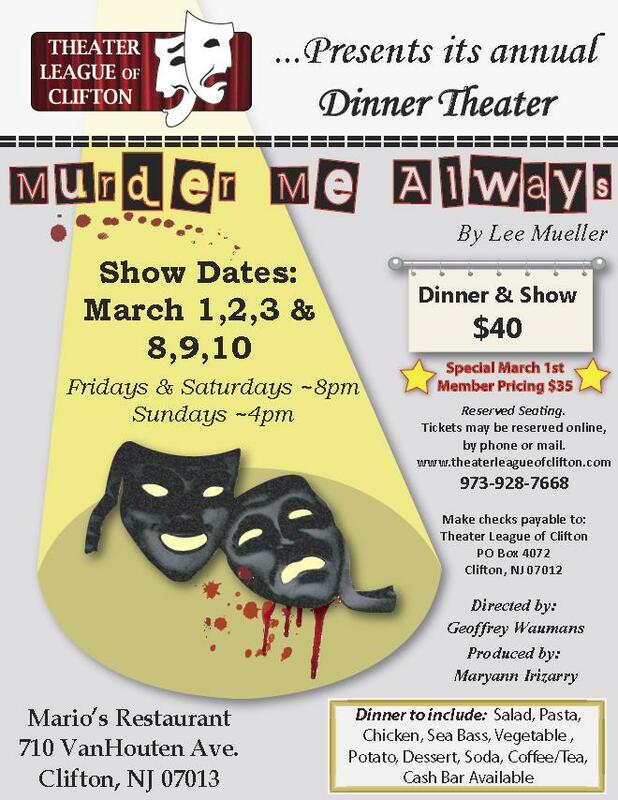 The production is directed by Alexander Oleksij of Nutley and features the talents of Elaine D’Addezio of New Providence, Elizabeth Engelberth of Denville, Honor Friberg of Norwood, Brian Merrill of Lincoln Park, Jacqueline Schreiber of Parsippany and Gordon Smith of Hackettstown. Elaine Paige has starred in numerous West End productions, on Broadway and in concerts internationally, sweeping to fame when she created her award winning performance as Eva Peron in Evita. Shortly afterwards she created the role of Grizabella in the original production of Cats and the classic song “Memory” became one of Elaine's many hit records. Further theatre productions include Hair, Jesus Christ Superstar, Grease, Billy, Chess (with her record breaking number one hit “I Know Him So Well” with Barbara Dickson), Anything Goes, Piaf, Sunset Boulevard in London and Broadway, The King and I and Sweeney Todd (New York City Opera). Elaine appears on Enlow Hall’s stage performing a selection of her favorite standards, her greatest hits and some of the modern classics from her recent album. Renowned for its superb acoustics and elegant design, the newly renovated 300 - seat Enlow Hall has been praised by noted performers and patrons for its intimate ambiance and proximity between musicians and audience members. For complete Enlow Hall 2012-2013 Season information, please visit the website or contact Ms. Cory Lees, Director, Operations 908.737.5932, ransomco@kean.edu. WQXR is a media sponsor of Gene & Shelley Enlow Recital Hall. Tickets may be purchased by phone at 973.971.3706, or in person at the Bickford Theatre box office. The Bickford Theatre is conveniently located within the Morris Museum, 6 Normandy Heights Road in Morristown, NJ, and offers free parking and full accessibility. Box Office hours for phone sales are Monday through Friday, 10 AM to 5 PM. Walk-up hours are Tuesday, through Friday, 11 AM to 5 PM. This national touring show features a chronological tracing of the Beatles career from their debut on the Ed Sullivan Show in 1964, to the psychedelic Sgt. Pepper era, to the final trip down Abbey Road and Let It Be. It is a performance that any Beatles fan, young or old, must see. If you were there, this is a fabulous journey back in time, if you were not there, this is an amazing way to see what the Beatles were all about. This sensational performance sold out when it last played at the Bickford. The Bickford Theatre is a professional theater that produces and presents year-round entertainment, including a Main Stage Series, two Children’s Theatre series, a Jazz Showcase, and Blues at the Bickford. The theatre is a Senior Member of the New Jersey Theatre Alliance, a not-for-profit organization of 30 professional theaters throughout the state, and works in conjunction with Actors' Equity Association (AEA) and the Stage Directors and Choreographers Society (SDC). From its beginnings in 1994 to the present, tens of thousands of theater-goers from across the tri-state area have enjoyed the Bickford Theatre’s many entertaining and diversified offerings in theatre, music and dance. The Morris Museum is an award-winning, community-based arts and cultural institution which serves the public through the presentation of high caliber permanent and changing exhibitions in the arts, sciences and humanities. The Museum also offers educational programs, family events, and is home to the Bickford Theatre and its wide range of performing arts offerings. Continuously serving the public since 1913, the Morris Museum has been designated a Major Arts Institution and has received the New Jersey State Council on the Arts’ Citation of Excellence, among other awards. In 2013 the museum will celebrate its Centennial Anniversary. These programs are made possible, in part, by funds from the New Jersey State Council on the Arts/Department of State, a Partner Agency of the National Endowment for the Arts; the Geraldine R. Dodge Foundation; the F.M. Kirby Foundation and the New Jersey Cultural Trust. The Museum is located at 6 Normandy Heights Road (at the corner of Columbia Turnpike) in Morristown, NJ, and is open Tuesday, Wednesday, Friday and Saturday, 11 a.m. to 5 p.m.; Thursday, 11 a.m. to 8 p.m.; and Sunday, 1-5 p.m. Admission to the museum is $10 for adults and $7 for children, students and senior citizens. Admission is always free for museum members and is free to the public every Thursday between 5 and 8 p.m. For more information, call 973-971-3700, or visit www.morrismuseum.org. Tickets are available online, via phone at 1-888-466-5722, or at the NJPAC Box Office, One Center Street, Newark. The NJPAC Call Center answers calls Mon through Sat from 10 AM to 6 PM, and Sun from 12 PM to 5 PM. The NJPAC Box Office is open Tue through Sat from 12 PM to 6 PM, and Sun from 12 PM to 5 PM. Tickets purchased online and via phone are subject to a per-ticket handling charge. Artists, dates, times, venues, prices, and programs are subject to change. This Grammy-winning, African American a cappella ensemble has provided a soundtrack to worldwide movements of social justice for over thirty years, and their variety of musical genres—blues, folk, gospel, hip-hop, reggae, African chants, lullabies and more—covers the full spectrum of human experience. Their powerful vocals, joined by hand percussion instruments and accompanied by American Sign Language interpretation, create a blend of moving lyrics and movement. For this special program, Sweet Honey will pay tribute to three legendary ladies of song: Miriam Makeba, Odetta, and Abbey Lincoln. Delta Rae is a fast-rising, alternative folk-rock band with four lead singers, a group that delivers stunning contemporary harmonies and an electrifying live concert experience. The group's joyous, rollicking sound touches on virtually all aspects of Americana, including gospel, country, bluegrass, blues and pop, as well as a deep-rooted tradition of storytelling, folklore and mythology. Following a string of successful 1970s comedies, including Greased Lightning and Which Way is Up? (both starring Richard Pryor) and Car Wash, director Michael Schultz (Woman, Thou Art Loosed) mined the mid-1980s mass emergence of hip hop culture with this narrative feature inspired by the early days of Def Jam Recordings. Krush Groove features the film debut of Blair Underwood as up-and-coming entrepenuer Russell Walker (a character based on Russell Simmons) as well as performances by Sheila E., Run-D.M.C., Fat Boys, Kurtis Blow, New Edition, Beastie Boys, and more. Author, journalist, and music and culture critic Nelson George will host and moderate a post performance discussion featuing music industry veterans Bill Adler and Bill Stephney. This fundraising event is in its fourth year and will include artwork for sale (hopefully yours! ), wine and cheese, dinner and live jazz. Usually they can accept an average of 3 or more pieces per artist, but this will depend upon the number of artists participating and will be determined closer to the date of the event. Participation deadline: March 15th – don’t wait! For the first time in her life, Claudine has toppled head-over-heels in love. But her celebrity-financial-guru mother has obvious misgivings about her daughter’s amorous entanglements with Henry—an artist with rugged good looks, just enough charisma and a negative bank balance. But does money matter when happiness is on the line? 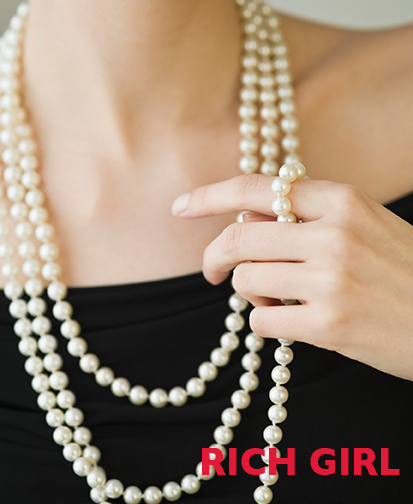 Rich Girl is a clever and hip new comedy about women and their relationship to men, mothers and money—in that order. TICKETS: $30 for premium seating ($27 seniors, $25 groups, $10 students), and $25 regular seating ($22 seniors, $20 groups, $5 students). Tickets and information are available at www.monmouthcivicchorus.org or 732.933.9333. Darrell Lawrence Willis, Sr. will portray Dr. Martin Luther King, Jr. in the Monmouth Civic Chorus concert I Have a Dream. This unique concert honors the 50th anniversary of Dr. Martin Luther King, Jr.’s iconic speech, and the 150th anniversary of the Emancipation Proclamation. Through music, readings, and reflections, the program will explore the growth of freedom in our country’s history. The music will range from African-American spirituals and Civil War songs to more contemporary pieces like a choral arrangement of U2’s moving tribute, MLK. Darrell Lawrence Willis, Sr. is a native son of Long Branch and a graduate of Long Branch Senior High School. He holds a BA in Communications and Theater Arts from Susquehanna University and MA in Theater Studies from Montclair State University, and studied extensively at Rutgers University Mason Gross School of the Arts. He is a faculty member at Brookdale Community College and Artistic Director of the Dunbar Repertory Company. The Monmouth Civic Chorus has been called "close to perfect" (Asbury Park Press), "alive and evocative" (The Star-Ledger) and "exceptional" (Red Bank Green). The Chorus is the proud recipient of the 2008 ASCAP/Chorus America Alice Parker Award, and the 2010 Spinnaker Award for Arts and Culture from the Eastern Monmouth Area Chamber of Commerce. Kids and their parents will have the opportunity to meet and work with Gail Lou, the award-winning teacher who will lead The Theater Project’s Performance Playhouse Class this spring. The 45-minute introductory session is free to students in grades 1 through 5 whose parents are considering enrolling them in the subsequent six-week class. During and after the free workshop, Gail Lou and Education Director Dennis DaPrile will be available to meet with parents and answer questions. Parents will be given information about the class, which exposes 1st – 5th graders to creating musical theater. That class will meet on six Wednesdays from 4:00 PM to 5:15 PM, and culminates in a presentation for friends and family. Gail Lou (right) is a teaching artist with 20 years experience, and a performer who has appeared in films and on television. Her teaching experience includes exposing children as young as six months to the joys of music, directing children’s choirs and high school musicals. She has been the musical director for Garage Theatre summer camp series in Teaneck since 1999, and teaches music and performance at Dwight Morrow High School in Englewood. Her recording accolades include Grammy Committee recognition for her independent single, "You Got the Vibe." Gail's children's CD, "7 Good Ways," was selected as a Parents' Choice Approved Award Winner, and two of her songs received highest honors from the John Lennon Songwriting Contest in the Children's category. She is the co-author of Light & Sweet—An American Tea Opera. All the Performance Classroom activities develop kids’ confidence in themselves while they develop skills and attitudes that go beyond the stage. Whether they go on to Broadway or the board room, these skills will last a lifetime! Parents can reserve space in the introductory workshop by email: Education@thetheaterproject.org. Go to www.thetheaterproject.org for further information. Education Director Dennis DaPrile is available to answer questions at 973.763.4029. Fontaiña was born in Riveira (Galicia), Spain in 1961 and moved to the USA with his family in 1978. He attended William Paterson University, planning to be a Spanish teacher, but his artistic interests overcame his desire to teach and he ultimately switched his major in the middle of his junior year, graduating with a BA in Art (Dean’s List) and a Minor in Spanish—a decision he has never regretted. An avid comic book reader, Fontaiña initially sought to create a career in comics, but discovered his style of art was not a good match. He enjoyed creating “pointillist” works with technical pens, small brushes and inks, and began exhibiting in galleries. Committed to detail and precision, Fontaiña spent a painstaking amount of time to complete each piece. He later discovered Sennelier oil pastels and worked in that medium for years. Then, satisfied with his accomplishments in pastel, he began to paint in acrylics. Gallery hours are Monday – Thursday, 9 AM – 10 PM; Friday and Sunday, 9 AM – 4 PM; closed Saturday and Jewish holidays. Admission is free and open to the community. For more information contact Rochelle Lazarus, Waltuch Gallery Director, at 201.408.1409 or visit the JCC website at www.jccotp.org. WHEN: Youth Art Month Exhibit Part I runs from March 1-March 10 and features students in grades 6 through 12. Part II features students in grades K through 5 and runs from March 15-March 24. Public receptions will be held from 2- 3:30 PM on Sunday, March 10th for Part I and Sunday, March 25th for Part II. Awards presentations will be held at 2:30 PM each day. WHERE: The Center for Contemporary Art, 2020 Burnt Mills Road, Bedminster, NJ. Each year for the past thirteen years, in celebration of Youth Art Month, The Center for Contemporary Art has hosted exhibitions of Somerset County student work in partnership with Art Educators of New Jersey. Youth Art Month has a long history going back to 1961 and is supported by the National Art Education Association. Each year, each state submits a Youth Art Month report to NAEA and awards of excellence are given to 4 states. New Jersey has been in the top 4 for the past 11 years. This year thirteen Somerset County schools will be participating in two exhibitions during the month of March. Six works of art from Somerset County have been selected for a State-wide exhibition which takes place at the Statehouse in Trenton where over 100 pieces of student work are on display from every county in the State. The young artists selected from Somerset County are Veronica Fabiano, grade 3, from the Cedar Hill School (Basking Ridge); Sophie Marsillo, grade 5, from Central Elementary School (Warren); Jennifer Adams, grade 6, from Montgomery Lower Middle School (Montgomery); Gianna Clarke, grade 8, from Montgomery Upper Middle School (Montgomery); Rose Tarantino, grade 11, from Hillsborough High School (Hillsborough); and Kaitlin Marion, grade 12, from Somerville High School (Somerville). Free public events are planned in conjunction with each reception. On Sunday, March 10th, artist and muralist Dan Fenelon will demonstrate his unique style of art and lead a group project designed for ‘tweens and teens. On Sunday, March 25th, The Center will hold a Family Open House with hands-on art projects for younger artists, and artist demonstrations led by The Center’s faculty. Tickets can be purchased online, in person (Tuesday-Friday, 10 AM-3 PM) or at 973.395.5551. Diane Moser has been composing and performing solo piano and ensemble music professionally since 1973. Raised in Ankeny, Iowa, Moser began her professional career as a solo jazz pianist at the age of 15. She learned her craft, like so many before her, “on the bandstand” with the help and encouragement of the top musicians in Des Moines, Iowa. After graduating from Ankeny High School in 1975, she went to Iowa City to attend the University of Iowa, playing in the university’s big band and leading two of her own bands, Talk of the Town and Satori. In 1977, she moved to San Diego where she was immediately engulfed in the jazz and new music scene, playing with such musicians as alto saxophonist Charles McPherson and bassist Mark Dresser. [Read More]. Andy Eulau (Bassist) has been on the New York music scene for 30 years. Since 1999, he has been a member of Diane Moser’s Composers Big Band, the Diane Moser Quintet and the Diane Moser Trio. He has recorded with the Bill Charlap Trio and the Anthony Braxton Quartet and was a Jazz Ambassador for the U.S. Department of State in 2003. He is a member of the Jazz Studies faculty at New Jersey City University. [Read More]. Scott Neumann (Drummer) has toured Europe, South America and Asia with artists such as saxophonist Dave Liebman and vocalist Madeline Peyroux and a part of the Woody Herman Orchestra. Since 2000, he has been a member of Diane Moser’s Composers Big Band, Quintet and Trio. He has been the director of drum studies at Lehigh University since 2005. [Read More]. According to Matthew Paterno, symphony conductor (left), the concert will feature "music that is sure to move you!" The Hanover Wind Symphony will be performing alongside the Edison High School Wind Ensemble and will be inviting seniors at the high school to perform Henry Fillmore's "Rolling Thunder" with the symphony. The HWS will also be presenting Instrumental Master Classes for the high school musicians during the afternoon. For 25 years, The Hanover Wind Symphony (HWS) has played to enthusiastic audiences. HWS members are volunteers who share a love for music as well as enriching the cultural fabric of the community with the thrill of live wind band performances. For further information about the March 2 HWS concert, visit www.hanoverwinds.org. NOW THAT THE OSCARS ARE OVER....we can get to the really important voting! 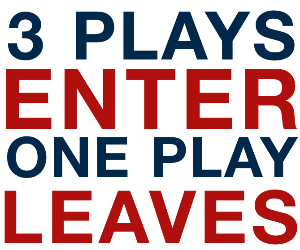 People have asked me to handicap the plays this year, but I'm not sure I can. The overall quality of the plays is better, and the individual voices of the playwrights clearer and more fascinating. I really think any one could come out on top. In these 3 plays, we look at spirituality and magic (Estelle Singerman), ethics and love (A Jew from East Jesus), and historical moments reflected through a familial lens (Leon's Dictionary). Maybe it's not as important who wins, as makes the most important, heartfelt, powerful statement about Jewish life in the 21st Century. Be there on March 9 to find out. Evening includes Bartleby, a film by South Orange filmmakers, Gerard Amsellem and Richard Stephen Bell, with Playwrights Theatre of New Jersey’s Artistic Director John Pietrowski in a featured role. ADMISSION: $10 and are available at the door. There are no advance sales. The evening will feature a number of short films and videos from 50 winning films selected from over 700 entries. Since 1981, the annual Black Maria Film and Video Festival, an international juried competition and award tour, has been fulfilling its mission to advocate, exhibit and reward cutting edge works from independent film and videomakers. “The Black Maria tour is an exciting evening of film and video. It’s not often that we can see innovative and well-constructed short films in a community setting. The shows are balanced and excellently curated. John Columbus presents a compelling and knowledgeable narrative that places the films in context and helps us to gain an insight into the more challenging work,” said Deborah Starker of the Madison Arts and Culture Alliance. The March 1 program will include the short film Bartleby,from South Orange filmmakers Gerard Amsellem, who directed the piece, and Richard Stephen Bell, who adapted the screenplay from Herman Melville’s Bartleby the Scrivener. Bell is also featured in the movie, along with Playwrights Theatre of New Jersey’s Artistic Director John Pietrowski. The film has received a 2013 Director’s Citation from the Black Maria Film Festival, and has recently been made an “official selection” at the Garden State Film Festival, and will screen during the festival (April 4-7, 2013). Amsellem, Bell, and Pietrowski will be present in Madison for a post-viewing talkback session. The program is part of the continuing efforts of the Madison Arts and Culture Alliance to promote and present quality arts and cultural offerings to Madison and the surrounding communities. A calendar of events and additional information on MACA can be found on their website at www.madisonartsnj.org. Two women plus twelve instruments equals one good time when Simple Gifts takes the stage. Drawing on an impressive variety of ethnic folk styles, this award-winning trio plays everything from lively Irish jigs and down-home American reels to hard-driving Klezmer frailachs and haunting Gypsy melodies, spicing the mix with the distinctive rhythms of Balkan dance music, the lush sounds of Scandinavian twin fiddling, and original compositions written in a traditional style. Combining tradition with innovation, Simple Gifts creates some of the finest arrangements in folk music today: swing fiddle creeps into a Romanian dance, spoons show up in an Irish reel, and the concertina ventures far beyond styles considered traditional for that instrument. Based in the hills of central Pennsylvania, these women play an amazing array of instruments. Linda Littleton, Rachel Hall, and Karen Hirshon switch with ease among two violins, concertina, mandolin, banjolin, recorders, bowed psaltery, hammered dulcimer, baritone fiddle, guitar, piano, and percussion. Simple Gifts is frequently complimented on their stage presence, which is warm, personal, and accented with humor. These women deliver their music with rare intensity and contagious enthusiasm. It’s obvious that Simple Gifts loves the music they play and knows how to share their excitement with the audience. This is an act not to be missed! 1:00 PM : Bring your instrument with you to the concert and Simple Gifts will teach each musician participating in the workshop one of their songs. During the concert, the guest musicians will be invited onto the stage to play with Simple Gifts. TICKETS: can be purchased on the day of the performance for $20 and all proceeds go to the Hurricane Sandy New Jersey Relief Fund. Edison Valley Playhouse will hold a benefit performance of Storm Stories, a collection of actor-written and performed monologues on the aftermath of Hurricane Sandy. Actor director Richard Kline (Three's Company) will direct members of his New Jersey and New York acting workshops in the matinee performance. Storm Stories evolved from an assignment by director Kline, asking his students to write a monologue based on their feelings before, during and after Hurricane Sandy. The difference in how the New York students were affected and those in New Jersey make for an interesting and theatrical contrast The results are at times funny, dramatic and always heartfelt. For more on the acting class, read the news article here. TICKETS: $20 for adults and $15 for students (18 and under). For tickets: visit www.summitplayhouse.org/tickets, or call 800.838.3006. NOTE: After the March 2 performance, there will be a talk-back with MONICA CARSKY, Ph.D.noted psychologist. After two 11-year-olds get involved in a squabble, the parents of both children meet to discuss the matter. As the evening goes on, the meeting degenerates into the four getting into irrational arguments, causing the discussion to drift far afield. “...delivers the cathartic release of watching other people’s marriages go boom. A study in the tension between a civilized surface and savage instinct, this play is itself a satisfyingly primitive entertainment.”—NY Times. “Elegant, acerbic and entertainingly fueled on pure bile. It’s Reza’s best work since ‘Art’.”—Variety. Featuring Michael King, Bob Mackasek, Claire McKinney and Elizabeth Royce. Since its founding in 1918, the Summit Playhouse has produced over 300 productions, making it one of the oldest continuously operating community theaters in the United States. The historic institution is devoted to maintaining the practice of theatre arts and encouraging those interested in all aspects of the performing arts and its operations. The Playhouse presents three shows a year: a Fall show in October and November, a Winter show in February and March, and a Spring show in April and May. During the Summer, Kaleidoscope theater for youth, presents a production for - and with! - students. The Playhouse is located off Springfield Avenue, just west of the Summit business district. The Playhouse’s original stone structure was constructed in 1891 and housed Summit’s first library. If the expression “Irish humor” brings to your mind leprechauns, kindly priests who look like lephrechauns, and warm and fuzzy sentimentality, be advised. You won’t find any of that in The Cripple of Inishmaan, Martin McDonagh’s black comedy now on stage at Centenary College’s Lackland Center. In fact, you won’t find much if anything warm and fuzzy in McDonagh’s body of work, which includes such stunners as the award-winning play The Pillowman, and the cult classic film, In Bruges. One of the most brilliant dramatists writing in the English language today, McDonagh has a caustic approach to humor and to life in general. He also has an unusual view of Ireland. Born and raised in London of Irish parents, he takes a long view of Irish tradition. He sees it not an outsider but not exactly as an insider either. The story is set in 1934 on Inishmaan, one of the Aran Islands, off the western coast of Ireland. The locals, a group of eccentrics to put it mildly, are so starved for novelty in their dull lives that they actually regard as newsworthy a goose biting a cat on its tail or a sheep being born without ears. The title character, known to all without regard for political correctness as Cripple Billy, amuses himself by staring at cows. An orphan raised by two foster aunts and now in his twenties, Billy is a lonely soul. He has a crush on Helen, the only young and pretty female we ever see. She has an inclination to violence, and spends a lot of time smashing raw eggs onto male heads, most particularly that of her brother, Bartley. The production is terrific. The Centenary Stage Company, a professional Equity theater, has employed the talents of award-winning set designer Bob Phillips, light designer Ed Mathews and sound designer Colin Whitely, to provide a perfect setting. Scene changes were handled unusually quickly and unobtrusively. As Billy, Tom Morin (left) managed to transcend the broad comedy around him, eliciting pathos without sloppy sentimentality. And his physical struggle, moving as a handicapped man, was startlingly and painfully convincing. Leah Barker was delightfully crazy as the violent Helen. We assume the real Leah Barker is civilized, but she managed to hide it totally as she became Helen. Broadway theater veteran David Edwards (Right, far right) made Johnnypateenmike, the bringer of news, into the engine of the play, the character who kept things moving. 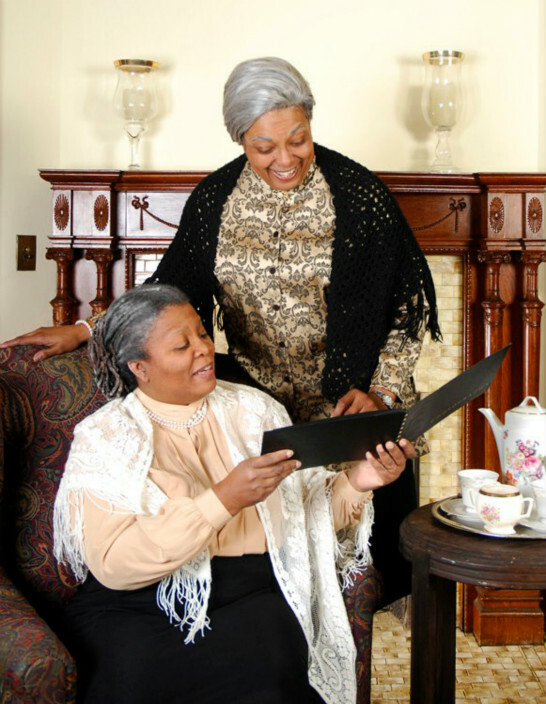 Funny and irritating, his scenes with his ancient and alcoholic Mammy, hilariously portrayed by Kathleen Huber (left), were side-splitting. Mark Byrne was ideal as Babbybobby, who seems confused as to why Billy should think he would prefer just to be called Bobby. Dave Scheffler, another CSC veteran, was persuasive as the doctor, the sanest character we meet. And kudos to Centenary College student Kyle Parham, who, as Barley, was the recipient of most of Helen’s violent attention. He took it like a trooper. At the age of 42, Martin McDonagh is perhaps the most important dramatist writing for theater and film today. This is an excellent and very entertaining example of his work and well worth seeing. It will run through March 10. BERGEN COUNTY PLAYERS OPENS NEW BLOCK OF TICKETS FOR "BEEHIVE, THE 60s MUSICAL!" A musical about the home for honey-making insects? Hardly! This Off-Broadway hit, under the direction of Dottie Fischer, finds its way to the BCP stage for the first time showcasing its nearly 40 songs that made the 1960s THE decade for female vocalists, ranging from Leslie Gore to Carole King to Tina Turner to The Supremes. This incredibly fun revue is all about the songs, the women singers and how deeply they were influenced by their social and political times. So if your musical tastes run from "My Boyfriend's Back" to "You Don't Have To Say You Love Me" to "Proud Mary" and "Respect," don't miss what is sure to be a rollicking good time; you’ll be singing along in no time!" (St. Louis Magazine). Celebrating 80 years, the Bergen County Players has grown tremendously from its roots as a small community theater when it was founded in 1932. Today, nearly 300 volunteer members, working on and off stage, make possible the nine productions presented each season. The remaining season includes: Better Late (March 23rd - April 20th, 2013) and Boeing-Boeing (May 4th - June 2nd, 2013). Remaining Second Stage production includes: The "Sing-Along" Sound of Music (June 21st-23rd, 2013). The first quarter of the year is a busy time, what with Martin Luther King, Jr. Day, Presidents' Day and Black History Month. The first we commemorate with reverence, the second with shopping, but I can think of no better way to mark the third than by heading over to the Westminster Arts Center in Bloomfield, where 4th Wall Theatre is performing Having Our Say: The Delaney Sisters' First 100 Years and join the centenarian Delany sisters in celebrating their beloved father's birthday and hear them recount the momentous events of their very interesting—and inspiring—lives. "Their first 100 years." Yes, you heard that right, for Bessie is 101 and Sadie is 103 at the time when an interviewer has come to inquire about their lives in preparation for a book. They are only too pleased to talk to someone new: "Everyone we know is either dead or boring us to death!" exclaims Sadie. As they tell their stories, feisty Bessie (sharp as "vinegar" and a "naughty darky" as her sister dubs her) keeps on interrupting her more docile sister Sadie (a Mamma's child, sweet like "molasses," according to Bessie) or one finishes the other's sentences so that there is never a lull in the conversation. In fact, the two women talk while they work preparing dinner in the little kitchen stage right or setting the dining room table with their mama's china and crystal stage left. And what a journey they take us on! From the slave origins and subsequent ordination of their father and the mixed-race heritage of their mother through Reconstruction and their childhoods at St. Augustine school in Raleigh, NC; to encounters with Rebby Boys, Southern white racists given to lynching Negroes for no reason other than the color of their skin; through Jim Crow South to Harlem in the 1940s and the Civil Rights era, Bessie and Sadie have lived full, exciting lives. They have been "good citizens of a country that has not always been good to" them. The backbone of their family has been their religious faith, and education was always the number one priority of their parents and the 10 children in the Delany family. The two women certainly fulfilled the latter goal: Bessie graduated from the Columbia University School of Dentistry and practiced for over 50 years in New York City while Sadie studied Domestic Science (more familiarly known as Home Economics) at Pratt Institute and became the first "colored" teacher of the subject in a New York City high school (she went on to earn a Master's Degree at Columbia University)! And although each had many beaus, the sisters never married; they'd rather be called "maiden ladies" than "old maids," indicating that they alone chose their single state. Mimi Francis (Sadie, right) and Gwen Ricks-Spencer (Bessie, left) turn in tour de force performances, ably helmed by Jeremy Gold Kronenberg on a marvelously evocative and intimate set designed by Jasmine Vogue Pai and lit by Nicholas Von Hagel. The two actresses deliver the massive amount of dialogue naturally and convincingly as though taking us into their confidence. They even call the audience "child," as though we are the young white woman who has come to interview them (Amy Hill Hearth, the author of the book from which the play has been adapted by Emily Mann). The actresses move and walk like elderly women, even when changing scenes; they never break character. Just as impressively, in the miniscule kitchen set, they conduct a complicated dance as they cut cucumbers and carrots, season chicken, stud a ham with pineapple and cherries, and move between the sink, refrigerator, oven and counter! It's a testament to their commitment and professionalism that Francis and Ricks-Spencer neither trip nor bump into each other as they talk! The love the two women have for their parents and siblings is evident throughout the performance and in the photographs projected on three frames behind them. What a beautiful family and how lucky we are to see them in the flesh! I especially love the photos of the real Sadie and Bessie that appear during the curtain call. Kudos to whoever chose the music to accompany the performance; Fats Waller, Duke Ellington, Ella Fitzgerald and more black musical titans set the scene beautifully. Janice Schopper's costumes are terrific and apt, as are the props chosen by Robert Lavagno to decorate the set and the hair styles designed by Brian James Grace. Having Our Say may be a tribute appropriate to Black History Month, but it speaks of universal truths applicable throughout the entire year: strength to pursue one's dreams in the face of racial and economic obstacles, tenacity, optimism and, above all, dignity of the individual regardless of race, color or creed. You will have one more chance to catch this marvelous production: Saturday night at 8 PM. Take your teenage children for a wonderful history lesson and a grand introduction to the theater. Bravo, 4th Wall—Theatre on the Edge! Having Our Say: The Delany Sisters' First 100 Years will be performed at the Westminster Arts Center, Franklin Street, Bloomfield . For tickets, call the box office at 973.748.9000 ext. 1279 or visit www.4thwalltheatre.org. TICKETS: $18 for adults and $17 for students and seniors. Sorry, no credit cards can be accepted at the theater box office, but may be used online. This largely autobiographical play focuses on the rise of the HIV-AIDS crisis in New York City between 1981 and 1984, as seen through the eyes of “Ned Weeks,” Jewish-American writer, gay activist, and founder of a prominent HIV advocacy group. Weeks favors loud public demonstrations to the quieter strategies favored by his associates, friends, and lover Felix Turner, who do not want to have the media spotlight thrown upon them. Their differences of opinion lead to frequent arguments that threaten to undermine their mutual goal. In 2000, the Royal National Theatre named The Normal Heart one of the 100 greatest plays of the 20th century. In 2011, it won the Tony Award for Best Revival of a Play. In the cast are Brian Craig, Dunellen; FJ DeRobertis, Westwood; Faith Dowgin, Spotswood; John Dowgin, Spotswood; Wayne Harris, Freehold; Rick Holloway, New York City; Rudy Palma, South Amboy; Douglas Spaulding, Highland Park; and Michael Stratton, Union City. A wine and cheese reception will follow the opening night performance.